Are you ready to explore the open road in a spacious and well-appointed RV? 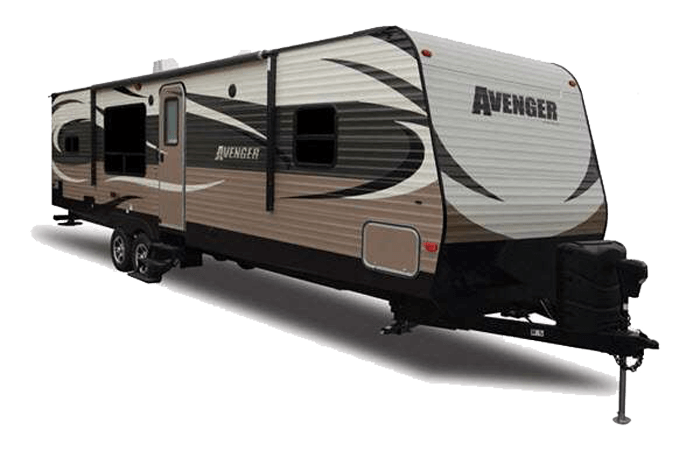 The Avenger Toy Hauler offers an excellent way not only to travel in comfort but also to take your toys with you. Avenger features a folding dinette and Murphy bed with plenty of room for your favorite toys, and the spring-loaded floor makes loading easy. If you need more room, select models add extra living space with lots of great amenities. The Avenger comes with the comfort of ducted heat and air as well as a deluxe patio awning and large double-door refrigerator. Other features include a spacious kitchen, convenient outdoor shower, camp kitchen and outdoor entertainment options. The Avenger even comes with extended drip spouts to keep your RV looking great!